Even in one individual theme, there are a million different ideas, resources, and paths to take when planning. Covering it all can be a little overwhelming for AP teachers and it’s definitely a lot for students to digest at one time. How do you teach everything a student might need/want to know about technology or global challenges in one unit? They could probably each be a year long curriculum! 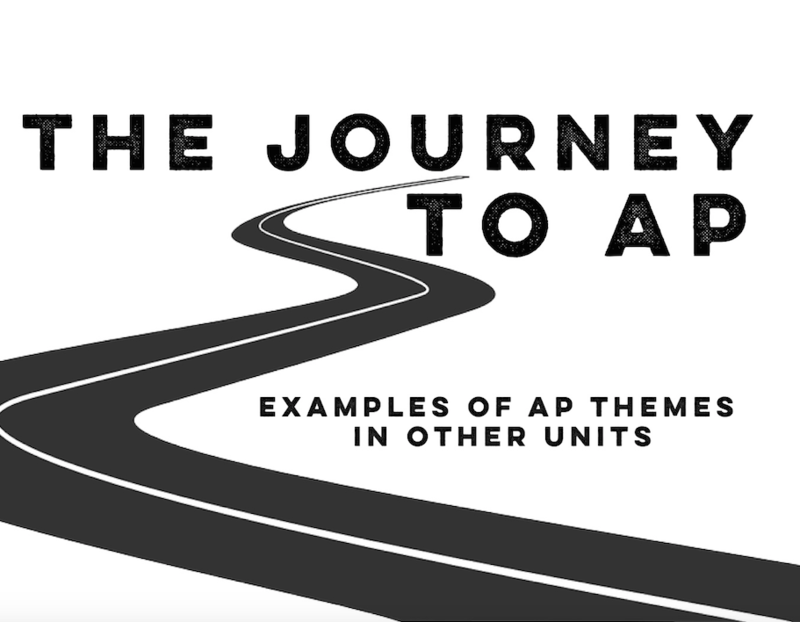 Here are some examples of how to touch on AP themes naturally in units that you’re already teaching! If you’ve been to one of our lesson/unit planning workshops lately, you’ve seen this authentic resource. I love this story and it inspired me to create a whole unit on street art. Basically, it shows how this team of Mexican street artists united the neighborhood of Las Palmitas and brought down youth violence by collaborating with locals on the largest macromural in Mexico. Recycled art is a a contemporary way to approach the sometimes formal art unit. Fabrice Monteiro is a Belgian-Benenise photographer who teamed up with Doulsy – a Senegalese costume designer who creates most of his outfits from trash. They created a series of photos that show the serious environmental issues facing Senegal. They say they may not be able to change things right away but these pictures can bring awareness and get people talking. The 103 mile wall that separated East and West Berlin showed the extreme difference of freedoms among the two sides. However, graffiti on the wall started a movement and after the fall of the wall in 1989 both sides were able to take part in this artistic expression of freedom. What messages were people sending through their art? What do the images say? This video shows how one man introduced the love of music to a unlikely group of kids… some of the poorest children in Paraguay. These kids live in a landfill, and their families work recycling and selling garbage they find there. Most could never even afford an instrument and had no dream of being in an orchestra. However, with a little help, they learn to build their own instruments out of waste and make beautiful music! This little clip from Telemundo’s series Celia shows the superstar before she got her big break. It also shows glimpes of racism and inequality when she’s not allowed to participate in the Cuban radio station’s music competition. She sings backup as her sister tries to win them over, but they can’t ignore her talent. The road to success isn’t always easy! Moral of the stor(ies): You can touch on one or more AP themes in every unit and in every level. They don’t have to be taught ONLY in an AP course and they don’t have to be taught in isolation. We’ll share some more examples for other units in the next few posts. Have any other ideas or resources to share that promote AP-theme thinking during an Art/Music unit? Leave a comment below… I’m sure others would love a few new ideas! Our district revamped the curriculum a few years ago to have the AP themes seen throughout every level and language taught (Spanish, French and Chinese) and it has made preparing for the AP test so much easier. I can teach more advanced content than ever before because they have a great foundation. I strongly encourage it! Yes, Eimy! That’s how it should be! Eimy- where do you teach? Could you share a link to your curriculum or a part of it? I really want our school to re-examine ours. It is currently just dovetailing the old Expresate textbook. Thank you for this. The clip about Celia actually fits in with what I am doing right now. Even for me, this is getting me to look at the world in a new way.